On Nov 1st, Lester Burkes (PPE, ’14) moderated a forum on Community Policing sponsored by City Club of Tacoma. Community Policing brings police and citizens together to prevent crime and solves neighborhood problems. Panelists included Sue Rahr (former King County Sheriff), Rev. 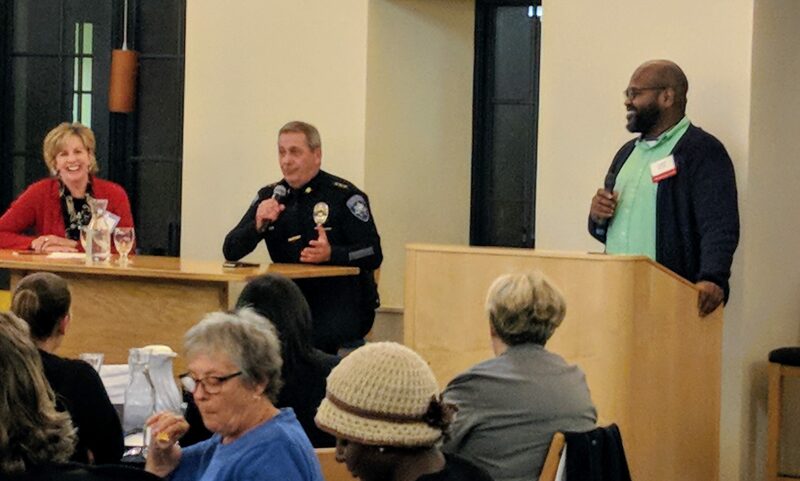 Gregory Christopher (Pastor of Shiloh Baptist Church and current President of the Tacoma branch of the NAACP), Don Ramsdell (Tacoma Chief of Police), and Marcus Rogers (Project Peace Executive Board and Tacoma Police Representative). Sue Rahr (left), Don Ramsdell (c) and Lester Burkes (r). Lester Burkes (l), Marcus Rogers (c), and Rev. Christopher (r). For the last few years, Lester has been a full-time instructor at Bates Technical College. When he was on campus pursuing his undergraduate degree in Politics Phil and Econ, Lester spent a quarter interning in Olympia with the State Legislature’s internship program (Politics, Philosophy, and Public Affairs Intern Program). We’re happy to report that Lester is currently back with us at UWT, as he is now pursuing a masters degree in Education. This entry was posted in Alumni Spotlight, Events and Speakers, Student Spotlight by pppauwt. Bookmark the permalink.